BRITTAS BAY, County Wicklow, Ireland -- Driving down the coast from Dublin, you pass through some wild and beautiful places, through small villages and narrow roads lined by hedgerows. You wonder if you've gone too far, or not far enough. But you persist. You've heard The European Club is not just an exceptional golf course, it's exceptionally unusual with two extra par 3s for starters. What's that all about? The European Club is the realized dream of Pat Ruddy, a ruddy Irish character, collector of golf books, publisher, golf writer and architect for 36 courses, including Ballyliffin Golf Club's Glashedy links, Druids Glen Golf Club and Rosapenna Golf Club. Ruddy lives and breathes golf. He has a home in Dublin, but his apartment over the clubhouse is a golfer's promised land with details such as elaborate moldings of crossed golf clubs, wrap-around windows looking out to the fairways and sea, and a spacious library with floor-to-ceiling shelves holding his vast and growing collection of 5,000 golf books and a pair of size 13 Johnny Miller shoes. In the 1980s, Ruddy went up in a helicopter looking for a site where he could build his course. When he looked down to Brittas Bay over the landscape of dunes running between Ballymoyle and Ardmore, he knew he had found the place. He bought the land, and opened the course in 1992. It's a course where metal spikes are recommended "for your safety." The approach is "fundamentalist" with "no fussy furniture on the links ... no artificial adornment." You play two loops through high dunes, marshlands and along a wild, exposed beach, up onto the cliffs of Mizen Head and deep into the valley at the 17th. 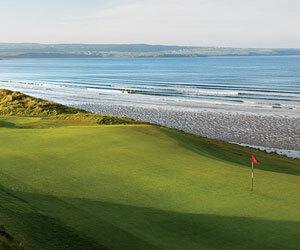 Sixteen holes have views of the Irish Sea, and many are dedicated to famous golfers such as Padraig Harrington (No. 3) and Peter Thompson (No. 5). The front nine is tighter, such as hole No. 7, with a river on the right and marsh on the left. The marsh represents one of the tomfoolery illusions Ruddy likes to play with. From the tee the marsh looks closer than it is by more than 100 yards. The back nine is more wide open with the sea always in view unless, of course, you're buried in one of those pesky bunkers. Hole No. 16 is especially striking with the sea running close to the fairway. There are 101 really testy bunkers, many walled with rail ties. But what can you expect from a guy who says, "Bunkers are hazards. They are not meant to be pleasure beaches. Why have them if they do not punish." You must know, a man who believes, "You don't add yardage, you add fear," is bound to have plenty of surprises up his sleeve. If you choose your tee unwisely he says, "Please call it suicide rather than murder!" There are more anomalies. What are palm trees and Pinehurst-style pines tucked in around the gorse and marram grass doing on this windswept Irish coast? Simple. Ruddy likes them. Having a rough round? At the 10th hole, look along the left side of the fairway for the Cursing Stone. Legend has it you can put a curse on a person or thing if you revolve the seven small stones on the top of the rock in a counter-clockwise direction. For the most part, there are few blind shots, a contrivance Ruddy calls "archaic," and greens invite pitch-and-run approaches. The European Club's 12th green, sitting on a plateau, is 127 yards deep, arguably the longest in the world. Ruddy says when Tiger Woods came to play here in 2002 along with David Duval, Scott McCarron and Mark O'Meara, he shot a course-record 67 and got a huge charge out of putting this green. Ranked among the World's 100 Greatest Golf Courses by Golf Magazine, The European Club more than holds its own against a strong field, especially for so unpretentious a club. It's a small (110 members), private club with a modest clubhouse and a "friendly disposition towards visiting players." The welcome card, written by Ruddy reads, "We give no apology that the thoughtless and inept player may suffer on our links. It was not created for such players." It's a good thing his daughter Sidon is on hand to set golfers off with a true Irish welcome. After all, running The European Club is a family affair with Ruddy's wife, Bernadine, two grown sons and two daughters helping out. And about those two extra holes? "I love golf. Why not?" Ruddy said. "If there are 20 or 25 fine golf holes out there why stop at 18? We are here to play golf." There are only about 160 true links courses in the world. The European Club is one worth playing. And while you're at it, you will do well to relax. Some of those shots may look scary, but it's designed for those who play and think well. "This isn't fair?" asked Ruddy. "Who said it was supposed to be fair?"